Picking up the pace on offense, the Wood River High School girls’ varsity basketball team matched its season-high in points Tuesday in a 39-35 non-conference road loss to the Filer Wildcats. Junior guard Ciceley Peavey (2 rebounds, 2 assists, 3 steals, 1 block) and freshman guard Mi-chelle Mason (3 steals) each scored 12 points for the Wolver-ines—the first time all season that Wood River (25.9 ppg) has put two players in double fig-ures. Peavey hit two 3-pointers as Wood River finished the game with a season-high four 3s. It was a welcome break-through for newcomer Mason (2-for-3 in 3-pointers, 2-for-2 free throws), who had scored only 15 points in the first Hailey eight games while acclimating to coach Matt Newhouse’s Wol-verines. Wood River (4-5, 0-3 league) tallied 17 points in the fourth, the team’s best output in a quarter all season, and out-rebounded Filer (8-3) by a 24-21 margin. The Wildcats, a 12-point winner over Wood River Nov. 23 in Hailey, struggled at the free throw line, 11-for-34. Assistant Hailey coach J.C. Nemecek said, “The girls fell behind 24-12 at halftime but came out strong in the second half, playing the Wildcats evenly in the third quarter and then making a hard charge in the fourth. Other contributors were Samantha Sutton (4 points, 7 rebounds, 3 steals, 1 assist), Hayley Pettit (4 points, 3 re-bounds, 1 steal), Manuela Cor-tina-Otero (2 points, 4 re-bounds), Rory Cole (6 re-bounds, 2 assists) and Blair Radford (1 point, 2 boards, 1 assist, 2 steals, 1 block). Wood River finished its pre-holiday schedule Thursday with a league game at Jerome (7-2, 2-1). The Tigers won 59-56 at Mountain Home Wednesday. Next up: A visit to Canyon Ridge (0-8, 0-4) Tuesday, Jan. 7. 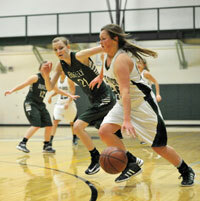 Twin Falls (7-2, 4-0) defeated Canyon Ridge by 31 points Tuesday, while Burley (7-3, 2-1) won 48-41 at Pocatello. Century of Pocatello was a 53-44 winner over Minico (3-6, 2-1).